Sao Paulo, Brazil - Brazil's President Michel Temer has survived another key vote to avoid facing trial on corruption charges. Opposition lawmakers did not secure enough votes in the lower house of congress on Wednesday night to put Temer on trial for charges of obstruction of justice and criminal organisation - allegations he has denied. Brazil's 513 seat lower house voted 251 in favour of Temer to maintain the presidency, a comfortable margin over the minimum 172 votes the president needed. "Once again we overcame the opposition," said congressman Carlos Marun, a staunch Temer ally from the same Brazilian Democratic Movement Party (PMDB), as he sang and danced shortly before the final results of vote were announced. 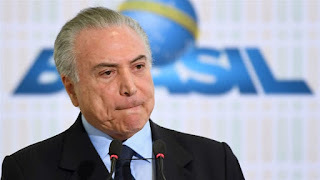 Those in favour of ousting the president fell short of the minimum of 342 votes needed to suspend Temer and send him to trial in the Supreme Court. "To put an end to this theater of vampires that Brazil is living in," said Luizianne Lins, a congresswoman from the North Eastern state of Ceara, and of the opposition Worker's Party, as she cast her vote. The charges relate to a corruption probe involving the meat packing company JBS. Temer survived a similar vote earlier this year on separate charges of bribery. The president has repeatedly denied any wrongdoing. The 77-year-old leader was hospitalised earlier on Wednesday for a urinary obstruction, but was released before the vote ended. Temer's victory was long expected by government figures and independent analysts. "It was a comfortable victory last time. And this time in the run up to the vote, there were no major betrayals – no allies left the coalition," Thiago de Aragao of Arko Advice consultancy told Al Jazeera. Watchdog group Contas Abertas confirmed to Al Jazeera in an email that Temer also released BR$2.2b ($680m) in funds for spending in congressional districts in the month leading up to the vote. While the practice is not illegal and has been widely used by previous presidents, critics argue Temer bought support from the congressmen of those districts. In the run up to the Wednesday's vote, Temer reduced fines for environmental crimes, a move seen by many as an attempt to appease Brazil's powerful agriculture caucus in congress which holds more than 200 seats in the lower house. Temer took power in 2016 after the impeachment of Dilma Rousseff who was removed for budget crimes. Rousseff and her supporters labelled the move a "coup". Once an ally of Rousseff, Temer had served as her vice president. Since taking office, Temer has enacted an austerity platform, which included a 20-year freeze on public spending. He now aims to overhaul Brazil's generous, but costly pension system with measures he defends as bitter, but necessary to get the country's finances back on track. Brazil plunged into its worst recession on record in 2015. Meager growth is expected to return this year according to Central Bank forecasts but with nearly 13 percent unemployment, most Brazilians fear recovery remains a long way off. The president has a three percent approval rating according to recent opinion polls, making him the most unpopular leader in Brazil's history. Temer is likely to remain in office until the end of 2018 when his term ends.